Halloween is approaching fast! Fall is one of my favorite season with days getting cooler, the leaves changing color and more time to bake and make soups and stews on those cold afternoons. Halloween is one of my favorite holidays to pack themed lunches for. Simply because there is so much you can do. 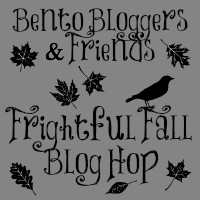 Bento Blogger's and Friends is having a THREE day Frightful Fall Hop and you can see three days worth of Fall/Halloween themed lunches starting Friday! I will post a link when all hops are live! 45 Bento Blogs sharing 50 Halloween & Fall themed bento lunch ideas. But for now you can enjoy our lunch and hop through to see 14 more! So, what did we pack? Beautiful photo, beautiful lunch. The colors just "pop"! Wish I could see your little one's face when this lunch is opened! It's fantastic. LOVE the sprinkles in the yogurt. Those chips are super cute too. Great lunch! Those coconut chocolate morsels look great, waiting for the recipe! This is such a cheerful lunch! It is so cute with those little bat sandwiches. Oh I love those ghost chips! The whole thing is great! And what a stunning photo. You're amazing! aww...the yogurt topping!!! Wish I could get it in my country :p Love it and great lunch! Super cute.. I love all the little touches! oooo - banana morsels! So want that recipe! The chocolate morsels and yogurt look so good! Great job on the lunch! 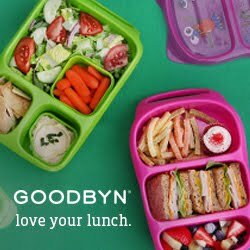 Super cute and I love the entire lunch!